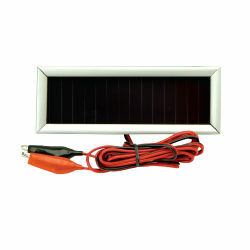 Great for keeping batteries charged in deer feeders, camping lanterns, and flashlights. Constant trickle charges your feeder batteries. Will not overcharge. Includes convenient mounting brackets. Alligator clips attach directly to any spring top or F tab battery.